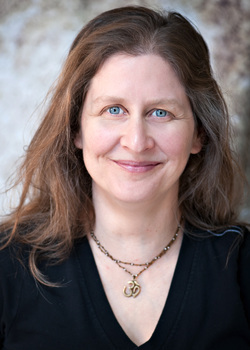 Amy Pancake, M.A., E-RYT, CYRT was first introduced to yoga while studying Vipassana meditation at Wat Suan Mokkh Buddhist monastery in Thailand (1992). She has been practicing yoga daily since 1998, and has taught over 5,000 yoga classes since completing the Sivananda Yoga Teacher certification (2002). She completed advanced yoga teacher training with Ana Forrest (2006), and has been exploring Continuum Movement with Emilie Conrad since 2006. Amy also studied Applied Kinesiology at The University of Texas (Austin) to broaden her study of movement. She enjoys teaching several different styles of yoga, including hatha, kids yoga and restorative. She is an authorized Wellsprings Practitioner in Continuum Movement (2017). Amy's yoga classes are designed to awaken and enliven every cell of the body so that fresh energy can flow and old fears and blockages may be released. We do this by learning breath awareness, internal alignment, creating space in the joints and moving from the core. Learn how to balance the dichotomies of stillness and movement, support and surrender, grace and structural integrity. Get rid of stiffness, old movement patterns, and tightness! A huge thank you to Monica Paredes for her beautiful photo work!